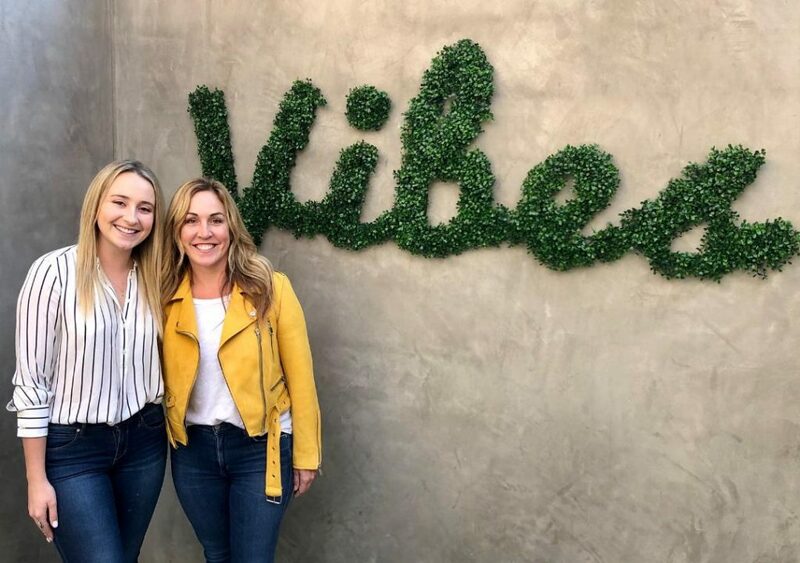 Owned by mother and daughter Cindy and Makenzie Hendrix, who both live on the Peninsula, Vibes Beach Cafe is the first venture into restaurant ownership for either of them. But this is one heck of a first run: Makenzie has an evident talent for design (Vibes is one of the prettiest restaurants in the city, large or small, with each tabletop seemingly chosen as an Instagram-perfect background), and family friend/Food Network chef Hugo Sanchez brings his culinary skills to the kitchen. Game-changing breakfast tacos. Photo by Erin DeWitt. Breakfast choices range from traditional (the Peninsula Plate is a classic eggs-toast-potatoes-meat combo) to more contemporary (the Breakfast Pizza comes with ham, sunny-side-up eggs, mozzarella and chile peppers). 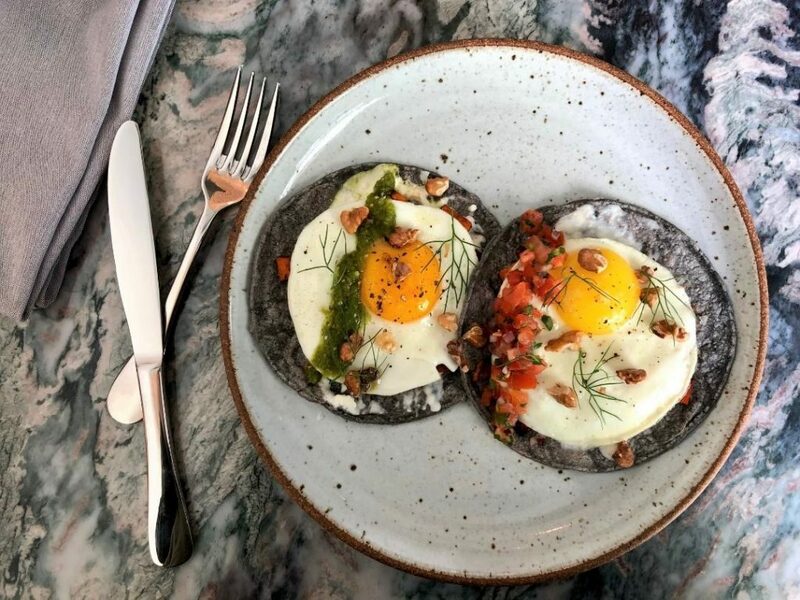 The Breakfast Tacos, which Makenzie calls “a game changer,” feature two soft blue-corn tortillas, a queso fresco spread, roasted sweet potatoes, sunny-side-up eggs, toasted walnuts, fennel and two different salsas. One taco has a stripe of fresh pico de gallo, the other a zesty green tomatillo sauce. “You shouldn’t have to compromise taste to be vegetarian,” she adds. The tartines on the menu are actually dressed-up toast options. The Avo Smash starts with the ubiquitous brunch standard of avocado toast, then adds heirloom tomatoes and a poached egg. My personal favorite is the Honey and Ricotta Tartine, an inch-thick slice of toasted sesame-seed bread smothered in ricotta, with pools of honey and a topping of even more sesame seeds. Salty, sweet, creamy, crunchy—get this one to-go on days when breakfast must be eaten during your commute. 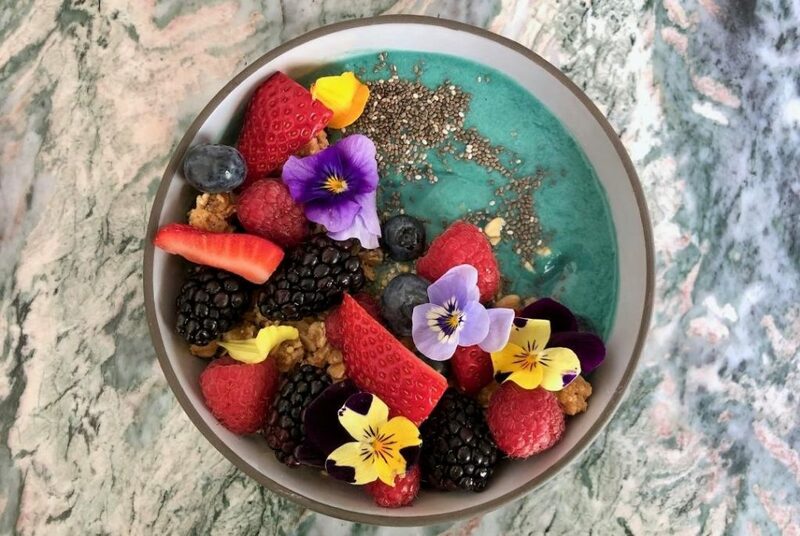 Vegan nutrient bomb the Blue Bowl is a frozen slushie mix of almond milk and tart-sweet tropical fruits that’s made bright turquoise by blue algae powder, then topped with sweetened granola, chia seeds, and a mix of perfectly ripe berries and flowers. Because everything here is beautiful. As of press time, Vibes Beach Cafe serves coffee every day starting at 6:30 a.m. and breakfast service at 7 a.m. Lunch is offered in the afternoon, and the place closes at 3:30 p.m. Come summer, hours may extend and introduce a dinner menu. “Everything we’ve done, we’ve done in stages,” Makenzie explains. Vibes Beach Cafe, 76 1/2 62nd Place, Long Beach, (562) 343-5572; www.vibeslb.com.